T. Roosevelt Presidential Campaign Bull Moose Party - Abraham Lincoln - Presidents and Political - Vintage Postcards | VintagePostcards.com: vintage, old, antique postcards for collectors. 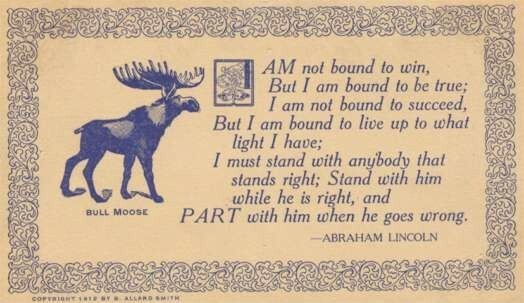 "I am not bound to win, But I am bound to be true.. . Abraham Lincoln." Copyright 1912 by B. Allard Smith. Political, elections.